Falmouth VIPS oversees a school-based mentor programs known as Project RISE (initiated in 1994). The program grew out of a need, identified by school adjustment counselors, for caring individuals who could spend an hour a week with a student to serve as a role model, supporter, and friend. While many students in need of a mentor are considered to be at-risk for one or more factors, other students come to the program because they have recently experienced change or a difficult situation and may be finding it hard to cope. A mentor can make a significant difference in that student's self-confidence and self-esteem. The VIPS school-based mentoring program has served as a model for other school districts, including Martha's Vineyard (the "Island Connections" mentoring program for ELL high school students), Bourne Middle School, Old Rochester Regional Vocational Technical High School (peer mentoring program), and Monomoy. Learn More about Mentoring by contacting the Mentor Programs Leader, Shona Vitelli, at (508) 548-1621 or by sending an email to mentor@falmouth.k12.ma.us. We can provide an orientation session, training, and introduce you to our veteran mentors who are always happy to share their experiences with new volunteer mentors. 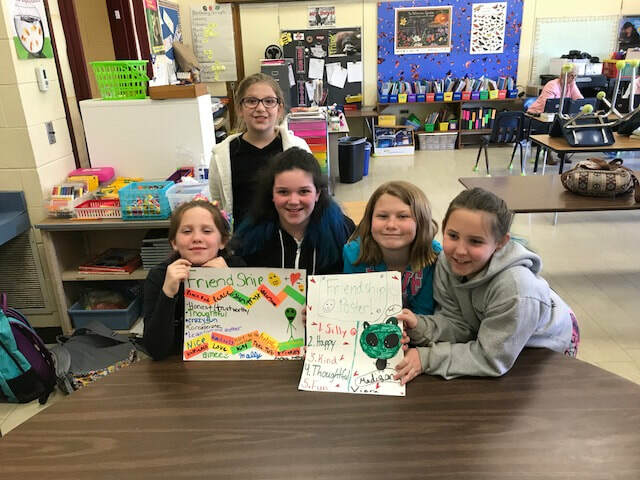 The VIPS School-based mentoring programs have received grant support from the Cape & Islands United Way, Kelley Foundation, Inc., Falmouth Road Race, and a State Mentor Matching Grant. Check out this episode of Falmouth in Focus to see FHS Graduate James Barrett speak about his mentoring experience during a recent mentoring event at The Statehouse organized by Mass Mentoring Partnership. 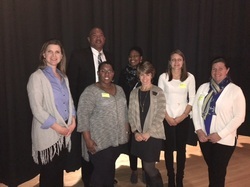 Top: The goal-setting workshop team: Anne Van Vleck, Garin Veris, Janeen Smith, Afi Tettey-Fio, Tracey Crago, Katrina Frylund, and Mairead Graf. Bottom: Students hard at work creating SMART goals. The theme of our 2018 Elementary School Storytelling Workshops was Finding Your Superpower. We began each workshop introducing the theme of finding the superpowers that may be hidden inside of us and the characters in the stories we would read. We started by reading The Smallest Girl in the Smallest Grade and Strictly No Elephants and then discussed and listed all the positive characteristics "superpowers" of the main characters in the stories to get them thinking about what "superpower" character traits were. Then they created a rainbow Me Mobile with hanging hand-prints. Students colored the rainbow then traced their own hands, cut them out and wrote one of their personal superpowers on each of the hands. The stories we read were selected because of their themes on acceptance, tolerance and social and emotional conflicts. The feedback we received from counselors, mentees and mentors was overwhelmingly positive. Students were able to take home with them a token of their special mentoring activity that carried with it a positive reminder of someone who believes in them along with the self-confident words and thoughts that they themselves chose to write on their hand prints. This activity allowed mentees to deepen their bond with their mentor by creating a special shared experience focused on strengthening their emotional fortitude and self-esteem. Strong, positive emotional memories such as these have a lasting impact on young people and serve as an experience that matches can reference and refer to in the future. One counselor reported at the end of the day, "I saw JR leaving school and carrying her rainbow. She had a big smile (which don't come easily) and was proud to show it to her guardian. Thanks so much!" Another counselor remarked, "I thought today went well - it was a wonderful activity." Many mentors requested that we hold more workshops like these in the future. · How do you feel when you learn something new? · What is difficult about learning something new? · What behaviors allow you to have the most success in learning something new? · What behaviors cause obstacles when you are learning something new? · Have you ever been in a competition? · Do you ever feel anxious or nervous about performing? · If you are on a team, what are your responsibilities to your team? · If you don't win, was it worth trying? Why or why not? · Do you think there are distinct gender roles in dancing? · Do you think having distinct gender roles in dancing helps or hurts gender equality? · What were some of the challenges faced by the young people in the movie? · Did they overcome their obstacles? If so, how? If not, why? The students and mentors enjoyed the movie and discussion, however the movie was too long for the allotted time frame and didn't leave enough time to finish the discussion. In the future we would choose a shorter movie or allow for an extended period of time. 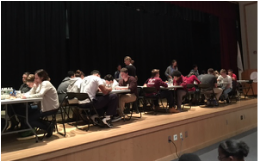 The theme of the High School Workshop was Self-Reflection and Goal-Setting. We first had each student take an online personality test and then had a brief discussion on whether the results were true or not. Then we dove into discussion of their personal values and priorities trying to determine where they came from and why they held them. Mentees completed a worksheet on what values they thought were the most important in the people around them and a set of questions of how they prioritized these values and how they could turn them into realistic short-term and long term goals. Students at this age love thinking about themselves and who they are and are going to be. Counselors and mentors provided very positive feedback on how focused, serious, respectful and open the classroom discussion was among the students. This was a very successful activity that culminated in them writing a letter to their future selves with the hopes that they could be reflective now on who they want themselves to be in the future. Support for the workshop was provide by funding from the Cape and Islands United Way and the State Mentor Matching Grant. VIPS relies on the expertise of school adjustment and guidance counselors and classroom teachers for referrals of students who may benefit from the VIPS school-based mentoring program. While many of our mentees are considered "at-risk" for one or more factors, our mentees are as diverse as our volunteers. VIPS mentor programs serve approximately 60 students with wide-ranging needs and interests. We always have students on our waiting list for mentors. Shona Vitelli is the VIPS mentor programs leader. “VIPS is so fortunate to have Shona join our team,” says VIPS Director Tracey Crago. “Her experience and enthusiasm for students and education are a perfect fit for this position. I’ve known Shona for several years and have always admired her communication skills and her thoughtful approach to taking on tasks,” Crago says. Shona holds a Bachelor of Arts degree in Anthropology and Human Biology from Temple University, a Masters in Secondary Education and a Master’s in Education in Science Education from Columbia University Teachers College. Shona taught middle and high school science at Hunter College High School and Bourne High School and most recently ran the community internship program at Bourne High School. In her role as VIPS Mentor Programs Leader, Shona works closely with the district's guidance staff to identify students who could benefit from a one-on-one mentoring relationship. She works with volunteers to provide training, guidance, and ongoing support throughout the matching process and the duration of the mentoring relationship. VIPS is very proud of our match success! Many of our mentor-mentee matches have been together for 2+ years, with some together for up to 8 years! Do you have one hour a week throughout the school year? Do you like the idea of making a difference in a child's life? VIPS collaborates with many local organizations to provide orientation, training, and ongoing support to its mentors throughout the school year. During regular monthly meetings and special evening presentations, mentors are updated on issues relevant to their students by professionals from the Cape Cod Community Health Center, Falmouth Human Services, Falmouth Substance Abuse Commission, Gosnold, Cape Cod Healthcare, Independence House, the Massachusetts Aggression Reduction Center at Bridgewater State College, the Barnstable County Sheriff's Department, and private practitioners in the health and wellness fields. VIPS is a partner and steering committee member in the Falmouth Prevention Partnership, a community coalition established in 2009 to address local conditions and risk factors conducive to risky behaviors in youth. Results from a survey of community youth found that: (1) youth lack opportunities and incentives for positive community involvement; (2) regular drinking among youth is seen as an acceptable way of dealing with stress and boredom; and (3) community transitions and mobility are high. These findings underscore the need for VIPS to reach out to at-risk students not currently served by our school-based mentor programs. In addition to our one-on-one mentoring programs, VIPS has partnered with Falmouth Human Services to add gender-based, after-school support groups for students ages 9-14. These groups follow the Girls Circle and Boys Council curricula, and are co-facilitated by volunteers and staff members who have completed the facilitator training program. What Do our mentors say about the program? Mentor Barry started mentoring one of his matches when the boy was in 3rd grade. Now in their fourth year together, Barry has seen many changes. He recalls the very first meeting, when the student showed up with a hooded sweatshirt hiding his face. It didn't take long for the hood to come off and now he always shows his face. "He's a cute little kid who likes being silly," says Barry. Since the beginning, Barry has brought an apple for his mentee each week to their meetings; it is a tradition they both enjoy. Barry recalls asking his mentee—at their third meeting—"Who's your best buddy?" He replied, "You mean besides you?" Over the years, Barry has received some heartwarming notes from the student. He agreed to share a couple of lines: "Just because of you I love every Thursday at school." "Barry, you have been an inspiration. Since I met you, you have [gone] out of your way for me. Thank you." Mentor Jill has been matched with her student for four years. Now a high school freshman, Jill says her mentee is really "coming out of her shell." The mentoring has been so incredible, says Jill, citing the consistency and trust as critical. "I think it is great to be able to say to a mentee 'you are of value.'" Jill was captivated by the shy 5th grader and saw her potential right away. "She has a great sense of humor and is very smart. She was struggling without peer relationships," says Jill. The two connected through writing and the characters in the student's stories. "We took it slowly, to establish safety and trust," she says. Her student is always there and excited to see her mentor. In spite of very busy schedule, Pat decided to mentor and was matched with an 8th grade girl. Many years later, she and her mentee continue to meet weekly; the student will graduate this year. Together they have explored post-high school options, including college and a possible career as a massage therapist. The student feels that her mentor is an adult she can talk to about anything, allowing a connection that helps her find her personal passion for life. Pat's strives "to be there to walk with her." When her student graduates, Pat intends to start over again with a new mentee. The VIPS mentor programs leader received a phone call from an acquaintance whose friend mentors students in Project RISE. She wanted to say thank you for the joy she is receiving from watching her friend develop his relationship with the two brothers he mentors. It seems these boys were laughing so hard, that the school principal walked by the room a few times to check in. With much adversity at home, these boys are finding the gift of laughter is helping break down the wall of sadness they have built. The mentor's commitment to routine-same day, same time, same meeting room-has really helped the relationship and connection form. As part of a pilot program, four high school students have been mentoring elementary school students. "Mentoring is about bonding," says one teen. "It makes me feel good that my mentee looks forward to our meetings each week." Another high school student likes the feeling she gets from mentoring: "it feels great to give back!" At one elementary school, the high school mentor works with his mentee on art projects, and always looks forward to their weekly meeting.